To get information about population dynamics, biology, moult and movements on Herring Gulls (Larus argentatus) and Lesser Black-backed Gulls (Larus fuscus) a colour-ringing program has started at Moerdijk Industrial zone. Because the project started recently there is only little information of breeding, wintering and migration of adult birds. Over 1,800 birds have been colour marked since 2003 and have given us information about the forage and movements of the birds. In the future it will be possible to get some answers about survival and the returning of young breeding birds. Moerdijk is located in the southwest of the Netherlands between Rotterdam (NL) and Antwerp (B). It is an industrial port where the birds breed among factories. Adult birds were trapped on the nest with walk-in cages and juveniles were caught by hand. Birds have been ringed at the tibia instead of tarsus. Tibia rings give more sightings in the higher vegetation of the colony and when birds are standing in water. Until now only two colours have been used: lime and orange. In the future blue, black, yellow and red are also going to be used. The rings have a two digit code (letter-letter, letter-number, number-letter & number-number) repeated three times. The rings seem to wear off less compared to tarsus rings. However, rings tend to be readable more difficulty in winter when the birds are "puffed out" and feathers cover the ring. 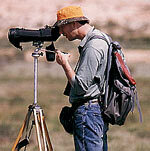 For observers unfamiliar with the project, marked birds are noticed less easily in the field. But once they have seen one, they discover them more often. Since 2003 over 800 adult and 300 juvenile Lesser black-backed Gulls and 450 adult and 300 juvenile Herring Gulls have been colour ringed. Between May 2003 and August 2005 over 15,000 colour-ring readings were collected. Most sightings were done during the breeding season. Breeding at Moerdijk has been known for Herring Gulls since 1980 (20 pairs) and for Lesser black-backed Gulls since 1983 (4 pairs). In 2005 over 500 Herring Gulls and over 2,000 Lesser black-backed Gulls were breeding at Tetra Pak and Shell Chemicals. Adult Herring Gulls usually arrive at the breeding area in late December and the beginning of January and concentrate on the breeding site from late February to early April. Nesting activities begin in April and incubation peaks around the third week of May (which is early comparing to other Dutch colonies). Adults with fledged juveniles leave their breeding area from the last week of July to late August. The first adult Lesser black-backed Gulls arrive at the breeding area in mid-February and concentrate on the breeding site from late March to mid-April. 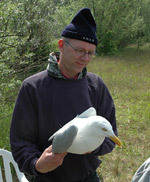 Nesting activities and leaving the colony are similar to Herring Gulls. We trapped 12 male Lesser black-backed Gulls on the nest which were ringed as nestling. Of those males 9 birds have been ringed as nestlings at Moerdijk. We also trapped 23 female Lesser black-backed Gulls on the nest which were ringed as nestlings too. Of those re-trapped females 19 were ringed as nestlings in foreign colonies and 4 were ringed at Moerdijk. So it seems that females are less bonded with the colony in comparison with males. We don't have exact details on Herring Gulls yet because they are less ringed in the Netherlands. Breeding birds are very faithful to their breeding colony and also to their breeding site in the colony. This has also been proved in the study of H.J.P. Vercruijsse on Herring Gulls in the Dunes of Schouwen. Of the 250 colour-ringed breeding Lesser black-backed Gulls breeding in 2003 89% were seen again in the colony in 2004. Until now there has been only one record of a Moerdijk breeding bird that migrated to a nearby colony (27 km). 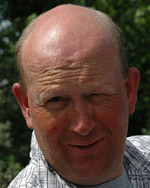 The birds from the Moerdijk-colony are mainly terrestrially orientated. There is no evidence that the birds fly offshore for marine food supply. The birds eat mainly rubbish, insects and worms. In the spring large groups of Lesser black-backed Gulls together with Black-headed Gulls and Mediterranean Gulls can be seen feeding on grasslands. 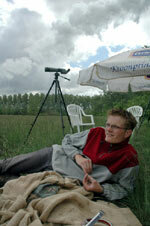 In 2004 birds were spotted in Breda on a rubbish collection site at 15 km from the colony. But since May 2005 this site has no longer been available for large groups of gulls so they had to move elsewhere. In June 2005 we found out that 67% of the colour ringed adult breeding birds feed on the rubbish-tip of Tilburg at 33 km from the colony. On 14 June 2005 238 different colour-ringed gulls sighted from the Moerdijk-colony were seen there. Strangely, during the breeding season, at the rubbish-tip of Bergen op Zoom (25 km from the colony) only one marked Lesser black-backed Gull from Moerdijk was spotted. It seems they avoid competition with birds from native colonies because ring readings of metal rings at Bergen Op Zoom give the idea that this rubbish-tip is occupied by the breeding birds from nearby colonies as Markiezaat, Volkerak-Zoommeer and Saeftinghe. Most adult Herring Gulls of Moerdijk seem to be wintering close to the colony (within a 50 km radius of Moerdijk) or along the coast of northern France (200-250 km). But perhaps this is an observer-effect because there is a big ring-read pressure nearby Moerdijk and in northern France. Juvenile Herring Gulls disperse in different directions from Schleswig-Holstein (D.) till Somme (Fr.). They are mainly observed on rubbish-tips, harbours and in natural tidal flats like the Oosterschelde (NL) and Baie de Somme (Fr.). The adult Lesser black-backed Gulls from Moerdijk are migrants. Most of them migrate along two different routes. The first route runs along the Western coast: from the North Sea coast through the Atlantic coast from France, Spain to Portugal and southern Spain. The second route is similar to the first route till the birds reach Spain. They then choose the eastern coast of Spain along the Mediterranean Sea down to Gibraltar (with observations at Tarragona and Malaga). There are also 12 records from the inland of Spain (Madrid, Toledo and Badajoz), but most sightings of adults are from Western Spain and Portugal (n=87 records) (1,500-2,000 km). There are also 10 winter records from the middle of France, 4 from Morocco, two from England and one from Mauritania (= 3,698 km). Most Lesser-black-backed Gulls were observed at beaches and rubbish-tips. Since 2005 we have taken pictures and made notes on the moult of the ringed adult breeding birds. Much more has been found about the variation of the phonologic characters of lesser-black-backed Gulls and Herring Gulls. Data on pigmentation of the eye, coloration of orbital ring, bill and legs as well as wingtip patterns and moult timing could be collected. They may very well help solving the problem of e.g. the identification of various sub-species of Herring Gull and Lesser black-backed Gull (for example argenteus versus argentatus and graellsii versus intermedius and heuglini). If you want to know more about our research or in case you observed or found one of our colour-ringed birds please inform us about it. As a thank you for your assitance/report we send you the complete life-list of the observed gull. Herring Gull male G [P5] near it's nest, Moerdijk 14 May 2005 (Jean-Pierre Leys). Herring Gull Mint green (lime) tibia-ring code G [A6], metal ring left tarsus, Moerdijk May 2005 (Theo Muusse). Lesser Black-backed Gull Orange tibia-ring code O [P7], metal ring left tarsus, Moerdijk May 2005 (Theo Muusse). Lesser black-backed Gull 4 CY male G [NZ] paired with unringed female, Moerdijk Tetra Pak 28 May 2004 (Pim Wolf). Lesser black-backed Gulls Larus fuscus and Herring Gulls Larus argentatus feeding on rubbish, Tilburg (Essent rubbish-tip de Spinder), Noord-Brabant, The Netherlands 23 June 2005 (Theo Muusse). 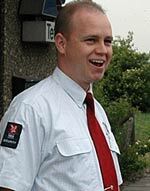 May 2005 ringing team (Theo Muusse). Lesser Black-backed Gull G [6E], Tarragona harbour, Spain, 27 November 2005 (Albert Cama Torell). Herring Gull G Moerdijk May 2005 (Theo Muusse). Upperwing, compared with kodak greyscale. Herring Gull G[L4] Amsterdam March 2006 (Ruud Altenburg). Seen at this location on several occasions. Life-history included.